Dakṣayajñamu or Dakṣayajnamu (unsure which version this is) From the University of Chicago Library. 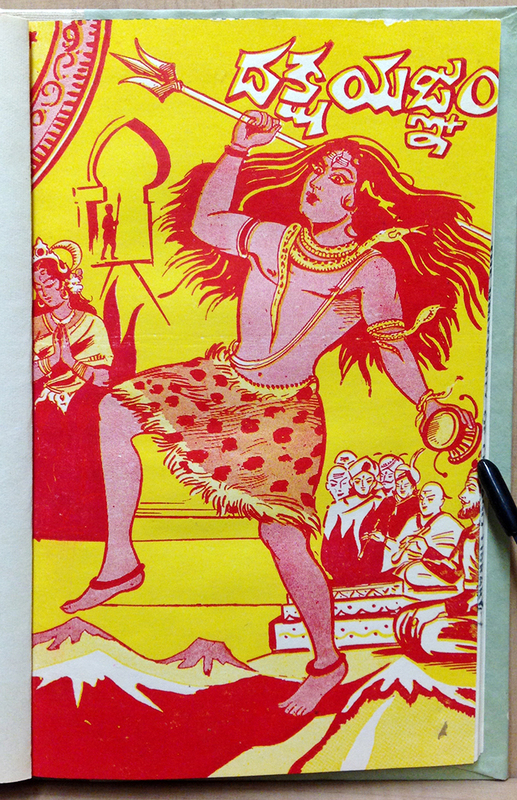 దక్షయజ్ఞం, commonly transliterated as “Dakshayagnam”, with a vibrant dancing Lord Shiva figure on the cover. Daksha is one of the sons of Lord Brahma, recognizable by his ram head (yes, ram, as in goat). Yagna, or Yajña means “sacrifice”, and refers to a ritual offering of labor or materials. Here’s a brief summary of Daksha Yagna story – a story which helped to develop the frightening practice of Sati. If the cover’s colors, illustration, and the lettering reminds you of flame, or make you sense some anger, then the artist has done their job!